Sometimes a girl just needs a bowl of cereal. 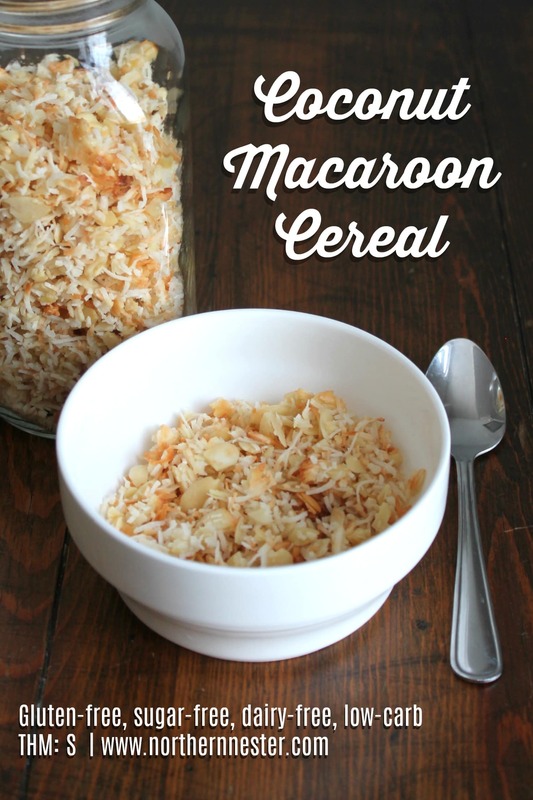 …this Coconut Macaroon Cereal that literally tastes like a coconut macaroon cookie! It’s perfectly sweet and keeps its bite when served in a bowl of cashew milk or stirred into a generous helping of Greek yogurt and berries (my favorite way to enjoy it!). My hubby and kids all agree: it tastes like a crumbled up coconut macaroon cookie! Served with unsweetened coconut, cashew, or almond milk, this cereal is a wonderful gluten-free, dairy-free breakfast or snack (or even dinner, when you’re having one of those days!). You could leave the seemingly insignificant bit of almond extract out of the recipe, but I don’t recommend it. That tiny amount yields a world of wonderful flavor to this cereal! This cereal is best stored in the fridge in an air-tight container. I keep mine in a Mason jar. This gluten-free, dairy-free cereal that tastes like a coconut macaroon cookie is a sweet way to start your day! Enjoy with a nut milk, or in a bowl with yogurt and berries! Pre-heat oven to 400 F. Combine all ingredients together in a medium sized bowl. Line cookie sheet with parchment paper. Spread coconut mixture evenly on top. Bake at 400 F for 5-7 minutes, stirring once, half way through. Cool completely before storing in an air-tight container. It is VERY IMPORTANT to watch your cereal closely while it bakes! 30 seconds too long in the oven can burn your batch! Remove from the oven when it begins to turn golden. You guys…MAKE THIS NOW!!! It’s so good and one of the easiest recipes ever! Hubby & I had a small bowl this morn and hubby loved it! Then I put rest in a jar for a homemade yogurt topping. Thanks Jacinda!!! You’re so welcome, Debbie! I’m thrilled you enjoyed it! Ok… just pulled mine out of the oven! If it tastes half as great as it smells, I will be thrilled!!! Waiting for it to cool…….. So I have a question, are you just toastiing the coconut or is everything mixed together and spread onthe sheet to meld & toast? Nancy, you mix it all together in a bowl (all ingredients) then, toast it in oven. EASY!!! I would like to try this recipe! Hello! This is something I really want to try! However, I do not have xylitol or thm super blend, and I do not really have a plan to buy them. My parents are sensitive to these powders that have sugar alcohols, so should I just leave it out or just use a small amount of what I have on hand (raw organic cane sugar, rapadura, coconut sugar, home harvested honey, home harvested maple syrup or date sugar)? I am trying to lose weight and limit my sugars, but if I do have to use sweetner, I would prefer trying to use something I have on hand and that is minimally processed as I can. Thanks for any help you can give me. It’s been awhile, I don’t know if you’ll get this, but try about 1/4 tsp pure stevia extract (powder, not liquid) for sugar-free sweetening without sugar alcohols. If you’d rather use honey, you can usually sub it 1:1 for xylitol (and they actually behave similarly in baked goods – xylitol draws in moisture like honey does). What do you consider a serving? 1/2 Cup? Oh soooo good…and easy! This totally satisfies my craving for cereal while on THM! Thank you, thank you, thank you!!! Thanks so much for this recipe! It was the first THM recipe I made when I started 6 weeks ago. I’ve made another double batch since. It’s my usual breakfast over greek yogurt with berries.